Discarded prosthetic limbs fill the courtyard of Bhagwan Mahaveer Viklang Sahayata Samiti (BMVSS), also known as Jaipur Foot. 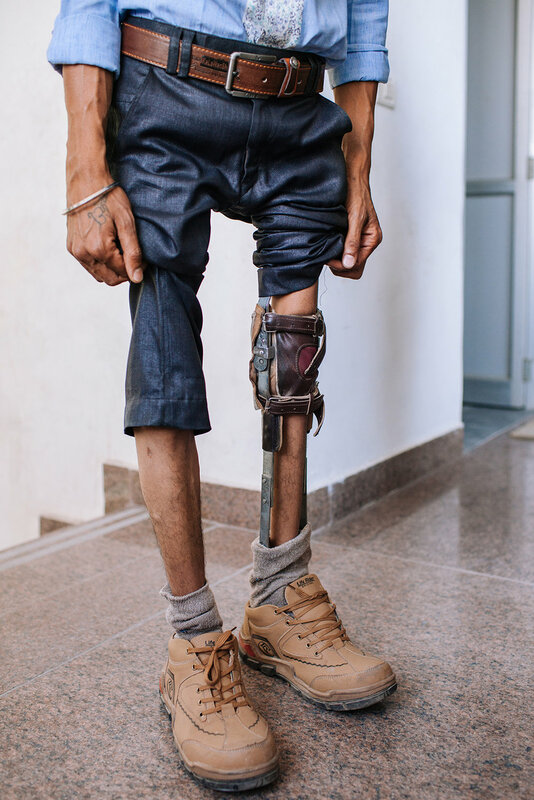 BMVSS is an organization based in Jaipur, India, specializing in low-cost artificial limbs. BMVSS has an open-door policy that welcomes anyone with a disability, treating both poor and rich patients. No prior appointment or registration is necessary. The organization’s structure and assembly-line approach to prosthetic limb fitting, helps BMVSS fit an average of 50 patients daily. Most patients return home in one to three days. If the procedure requires more time, the patient can stay at the center at the expense of the BMVSS until the fitment is complete. Although BMVSS doesn’t advertise its work, people from across India travel to its center based on word-of-mouth publicity. D.R. Mehta founded BMVSS in 1975 to help people regain their mobility, as well as their their livelihood and dignity. He says that seeing people in the morning arriving with nothing and unable to walk can be depressing but by evening, everything changes. Soumit was on a motorcycle with his father when they got into an accident. His family spent thousands of dollars in private medical facilities in attempts to save his leg. This was his first time at BMVSS. Soumit is 15 years old and wants to be a doctor. The occupational, economic, socio-cultural needs of Indian amputees significantly differ from those in the West. People in India need to be able to squat or walk barefoot, oftentimes on a rugged terrain. Therefore it’s important that the foot is durable, waterproof and looks like a normal human foot. A combination of wood, rubber core and vulcanized rubber coating (seen on the photo) are the three pieces of Jaipur Foot design. A number of technicians working at BMVSS are former patients, who have been trained in the Jaipur limb technology. Having gone through the fitting themselves, they can empathize with patients, which helps strengthen BMVSS’s patient-centric spirit. 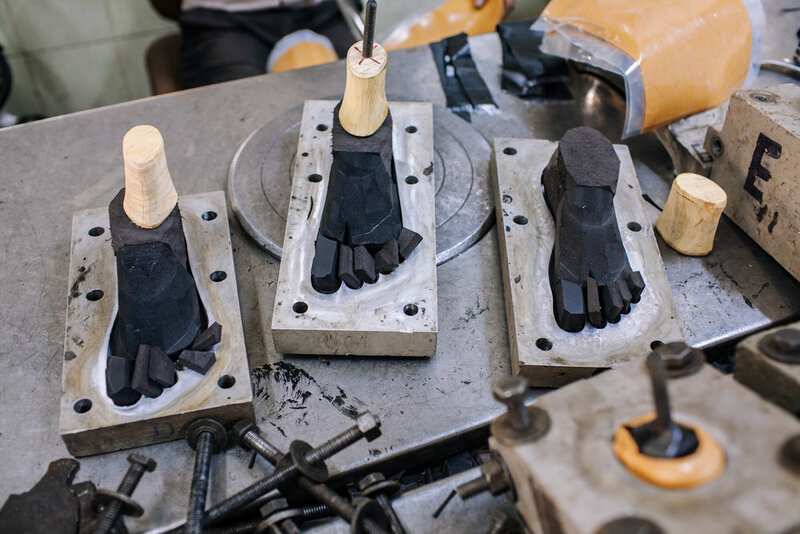 The sponge rubber forefoot is manually cut before being wrapped in rubber and vulcanized in an aluminum casting dye. 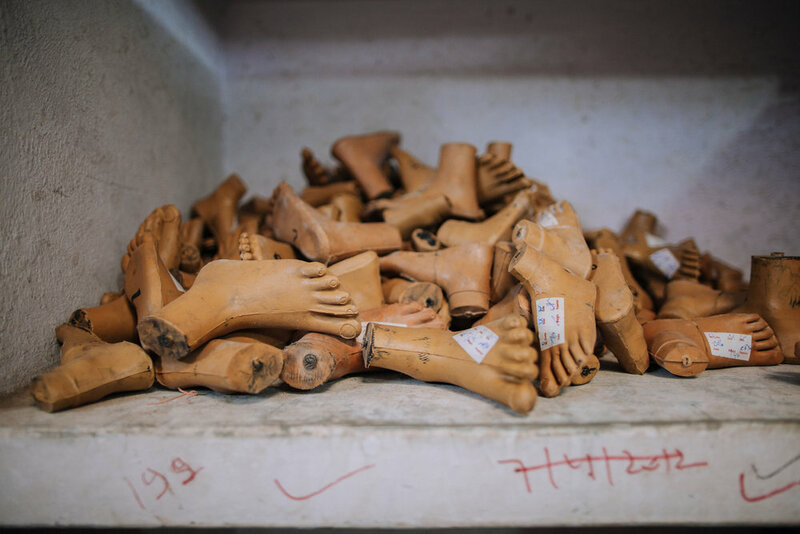 The Jaipur Foot has a lot of international recognition as it found use among landmine and war victims. While an artificial limb can cost several thousands of dollars in the US, the Jaipur Foot costs only $30 in India. Road accidents are common in India, often due to poor driving or badly maintained roads and vehicles. India's ministry of road transport reported that 500,279 people were injured in road accidents in 2015. A negative mold of patient’s limb is being made to customize his prosthesis. High-density polyethylene pipes used for the above-the-knee prostheses. Initially, the Jaipur Foot was fitted onto below-the-knee amputee using an aluminum shank to connect the patient’s limb and foot. The idea of using an irrigation pipe made of high-density polyethylene (HDPE) was born in 1985. The use of the pipe as a shank was successfully integrated into production, offering easier shaping according to each patient’s limb measurement and simplifying the overall process. Using the high-density polyethylene pipe successfully got rid of the potential stress points, previously the case with aluminum. The HDPE pipes are low cost, durable and high-quality. Patients wait for the measurements. BMVSS sees more cases as a result of accidents than illnesses. The organization provides artificial limbs, calipers, physical aids and assistance completely free of charge. After a seemingly innocent injury, Dimpal's foot got infected. Due to gangrene, she lost her limb as a 22 year old student. She is now 32, lives in Delhi, is unmarried and unemployed. She wants to set up a shop and start making sweaters to generate an income. This was her 6th limb from BMVSS. 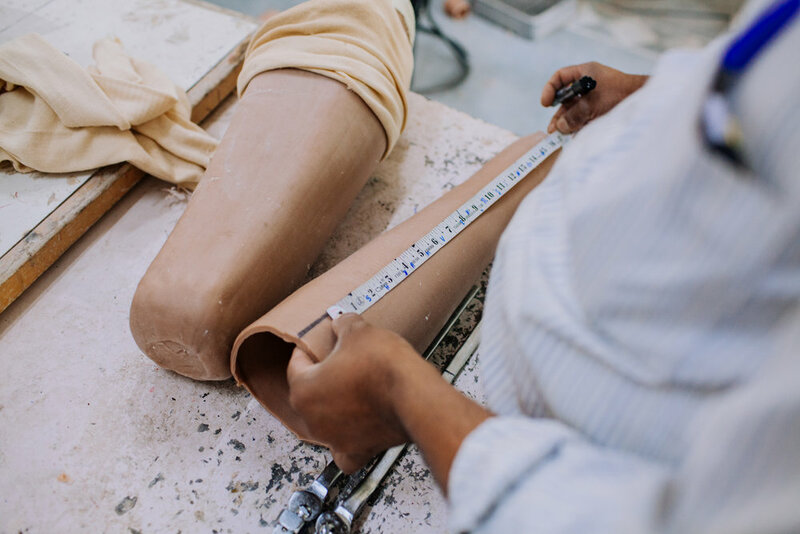 BMVSS collaborates with premier science and technology institutions in India and worldwide to improve the quality and to reduce the cost of its prosthetics. 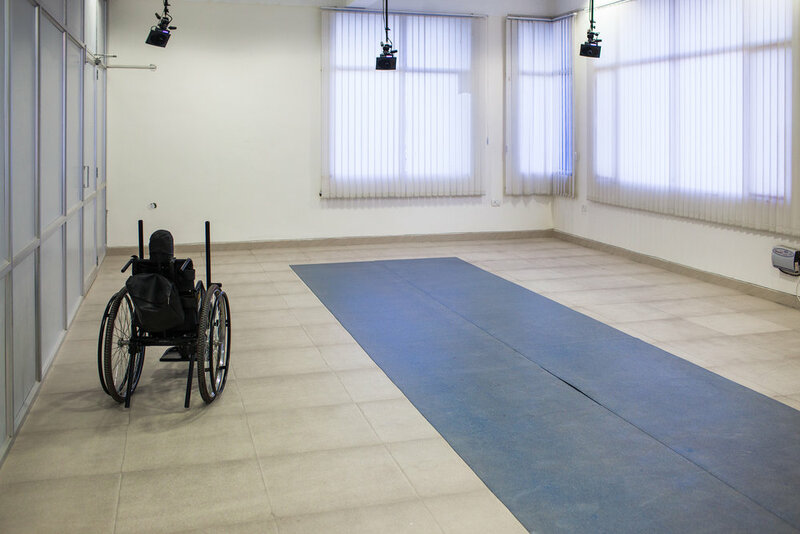 The in-house research and development division is conducted by Professor MK Mathur and supported by Dr. Pooja Mukul—both experts in the field of rehabilitation. An intense collaboration between a sculptor Ramchandra Sharma, Dr. Sethi, Dr. Kasliwal and Dr. Udawat (their portraits hanging on the wall of BMVSS’s research facility) ignited the beginning of Jaipur Foot’s story. Their mission was to design a low-cost prosthesis that could be manufactured and fitted quickly, using a simple process and local materials. Gait and Movement Analysis Lab uses advanced technology to create a 3D gait pattern. As a patient walks down the blue mat, 4500 pictures are taken in 15 seconds by 6 cameras. While polio has been eradicated from India, people with existing cases of polio continue coming to BMVSS for caliper fitment. This patient is on his way to the gait check room. Meenu Devi got polio when she was 6 months old. She currently studies education and wants to become a professor of economics. This was her second visit to BMVSS. The Stanford-Jaipur Knee is designed by the Stanford University, working in collaboration with the BMVSS team. The Stanford-Jaipur Knee has been noted by Time magazine as one of the 50 Best Inventions in the World for 2009. The knee costs $20. A titanium replacement could cost as much as $10,000. The Stanford-Jaipur Knee consists of five pieces made of oil-filled nylon polymer that self-lubricates with use, and four standard fasteners. The design allows for 165-degree range of motion, allowing the person to kneel and squat. Welding a hand-pedaled tricycle frame for patients who have lost both their feet or mobility of their lower limbs. The tricycles are provided free of charge and enable patients to independently move around and increase their autonomy. Gopesh was 16 years old when a wall collapsed on his leg, causing him to lose his left limb. This was his first visit to BMVSS seeking a hand-pedaled tricycle for more efficient mobility. Gopesh is 24 years old. The manager, Om Prakash Sharma in the main BMVSS office in Jaipur, India. Padma Bhushan Devendra Raj Mehta, the Founder and President of BMVSS. In 2008 the President of India awarded him the Padma Bhushan, one of the three highest civilian honors. Dynamic, energetic, passionate and relentless. He not only runs the administrative operations, but also meets with patients to understand their needs and help them return to a normal life. In addition to its main center in Jaipur, BMVSS had established 22 branches across India. Since its inception, BMVSS had organized over 50 camps across 26 countries, training people to fabricate the foot and to employ the fitment technique. Equipment is left behind so that fitments can continue even after the camp ends. BMVSS has already helped over 1.55 million amputees.